Securities and mutual funds that have increased in value and been held for more than one year are popular assets to use when making a gift to the IRC. Making a gift of securities or mutual funds to us offers you the chance to support our work while realizing important benefits for yourself. You can reduce or even eliminate federal capital gains taxes on the donation of appreciated securities or mutual funds you have held more than one year. You may also be entitled to a federal income tax charitable deduction based on the fair market value of the securities at the time of the transfer. A gift in your will or living trust. If you aren't ready to give up these assets during your lifetime, a gift of securities through your will or living trust allows you the flexibility to change your mind at any time. You can continue to receive dividends and participate in shareholder votes, and the securities are still yours if you need them for other expenses. 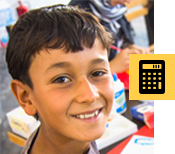 In as little as one sentence you can ensure that your support for the IRC continues after your lifetime. A donor advised fund. When you contribute to a donor advised fund with appreciated securities, you may receive a federal income tax charitable deduction for the fair market value of the asset and eliminate capital gains tax. Because of our nonprofit status, the IRC does not pay capital gain tax when we sell the gifted securities. A memorial gift. If you have a friend or family member whose life has been touched by the IRC, consider making a gift to us in his or her name. A charitable gift annuity. Funding a gift annuity with appreciated securities or mutual funds will not only provide you with reliable payments for life and allow you to support our work, but it can offer numerous financial benefits. First, your annuity payments are often more than the dividends you would receive each year from the securities. Second, you will receive a federal income tax charitable deduction in the year the gift is made (when you itemize). Third, you will eliminate part of the capital gains tax you would have paid if selling the securities. Contact Sophie Davidson at 212-293-1343 or Plannedgiving@rescue.org for additional information on appreciated securities.